During my summers growing up, I used to kill time with the cousins. My neglectful aunt would release us at West Coast Video or Blockbuster, and we’d get to pick out our babysitters for the week from the horror section. Many muggy nights were spent in their cluttered basement witnessing bodies mount and blood splatter. Accustomed to murderous circus clowns and blood-sucking space mutants by the second grade, these supposedly “scary” shows slowly stopped spooking me. Every so often, however, the odd disturbing flick would come along that my parents would allow me to watch with them, and whether by proxy of their being present, or as a result of my Catholic guilt-ridden conscience releasing itself from all those secret showings, I’d convert my spring mattress into a water bed afterwards. As much as it embarrasses me to admit, a movie with a soundtrack headlined by Little Richard used to crawl under my skin and claw at my bones. Whipstaff Manor is the name of Casper’s antiqued abode on the shores of Maine, and what a place it is: a myriad of rooms decorated with cobwebs, dust, and stained glass. Casper’s anti-social ghost uncles, Stretch, Stinkie, and Fatso, also habitat the seemingly inhabitable house of horrors. They force Casper to clean up after them and cook meals, which immediately exit their spectral bodies like a vorarephile’s wettest dream. The plot centers around the Lazarus, an underground machine created by Casper’s grieving father to reunite with his dead son. He passed away before the contraption was ever finished and, therefore, was never able to reunite with his boy in the hereafter. Things become darker when we learn that Kat’s father, a struggling parapsychologist, has similarly destroyed his life by wandering around the country, hopelessly trying to find answers about the existence of ghosts to deal with the sudden passing of his wife. While studying the spirits of the manor, he hits the bottle hard one night and falls to his death in an open trench. According to the movie’s logic, when somebody perishes and becomes ethereal, they completely forget about their past life. So Ghost Dad no longer recognizes his daughter, whose tears he laughs at as she comes to terms with being all alone in the world. Meanwhile, if that weren’t enough misery, the film’s duo of “fleshy” bad guys go after one another with axes until one dives off a cliff and drowns in the stormy sea below. When I was younger, this movie undercut everything that the Sacred Heart nuns had ever promised me, challenging my innocently naive vision of Cloud Heaven. Casper made me question whether I might ever see my first dog again or my box turtle that expired in a locked car one hot afternoon. The next life suddenly became murky and isolating, painful and petless. That prospect was more frightening than any Hollywood slasher picture I had ever seen. Death seems so foreign to a child, but its clammy hands tucked me in at night after watching Casper, permeating my dreams like a thick fog. 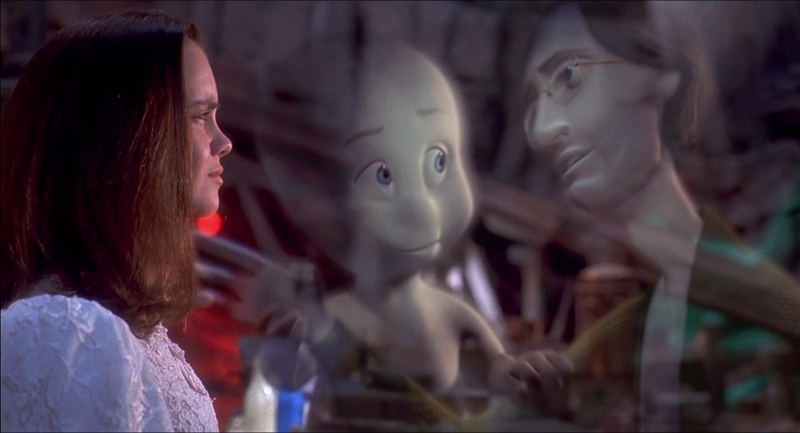 That Casper the Friendly Ghost would have me suffer an existential crisis should give you a terrifying glimpse into my psyche. 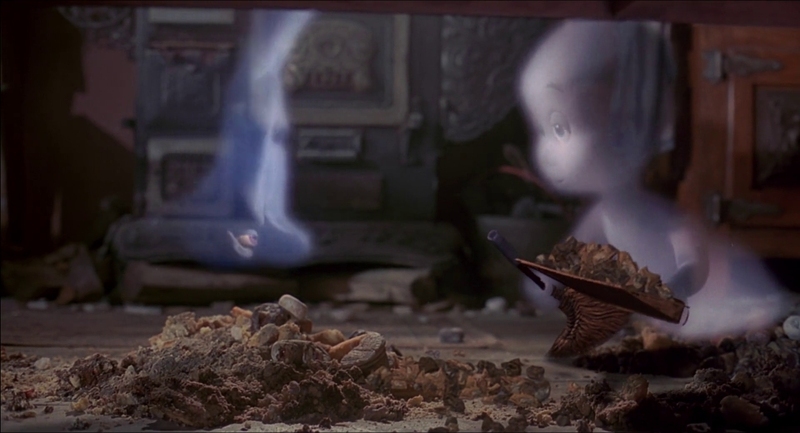 The Steven Spielberg-produced Casper opened on Memorial Day weekend in 1995 and went on to become the eighth highest grossing motion picture of that year (link). Harvey Comic Entertainment, the owners of the franchise, licensed the property to Universal Pictures two years prior after selling 20% of its common shares to Universal’s parent company, MCA, in December 1990 for $3 million (link). 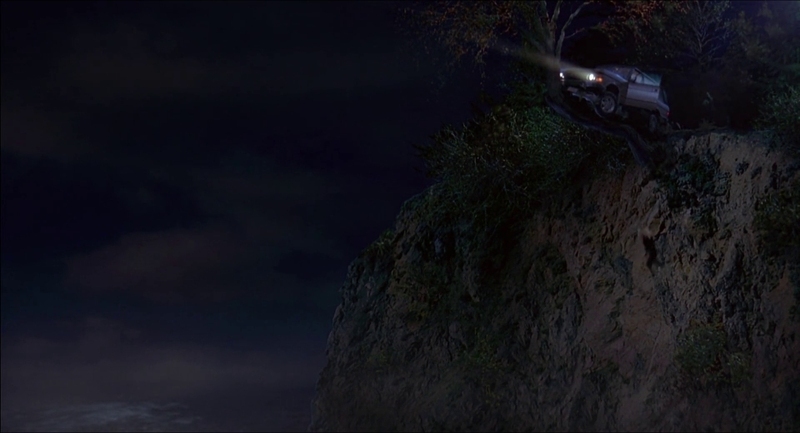 That business arrangement forced the normally shy spook not only on movie theater screens across the globe, thanks to the computer-generated special effects by Industrial Light & Magic, but also on several merchandising products leading up to the film’s release. 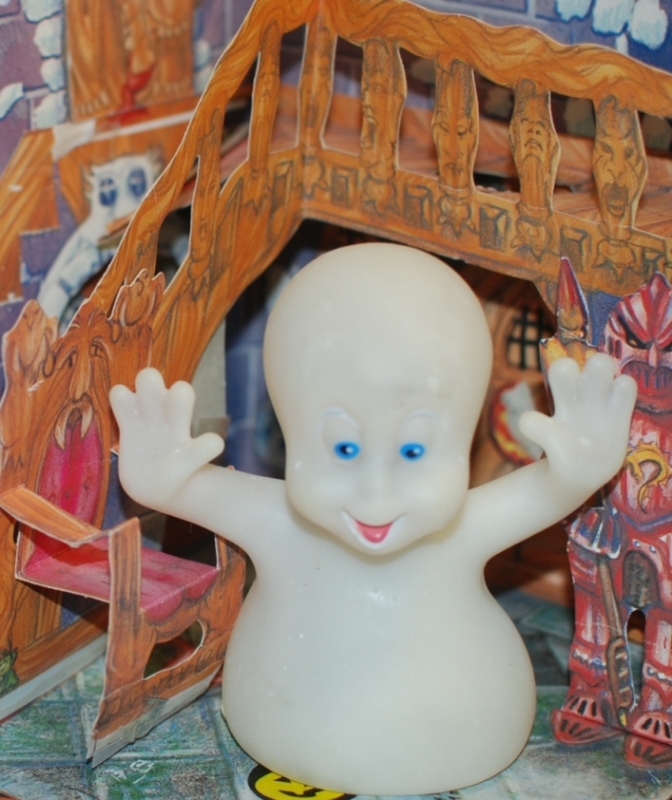 To capitalize on the movie, Casper became awfully friendly with toy makers, namely Tyco Toys, which stocked store shelves with Casper-related figures, like a pizza-scented belching doll. According to the Daily Variety, Pizza Hut, then a subsidiary of PepsiCo, competed against McDonald’s to score the coveted Casper fast food tie-in, shelling out approximately $15 million in media money. 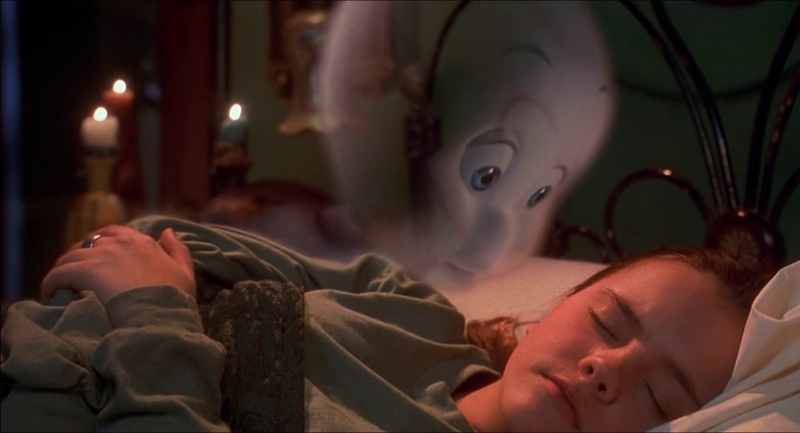 “This effort on Casper is the largest promotional program Amblin has ever put together in terms of television and point-of-purchase,” Brad Globe, Amblin Entertainment’s marketing vice president, told the Hollywood trade magazine. As a concession prize, McDonald’s teamed up with Warner Brothers to sell .99 “glass-chiseled” Batman Forever mugs, while Pizza Hut restaurants celebrated their win with $1.49 glow-in-the-dark Casper hand puppets. For a kid, there was no finer time to be alive, if not quite yet diabetic. The apparition haunted the gaming industry, as well, courtesy of several console conversions put out by Interplay, and a Game Boy title distributed domestically by Natsume in 1996 (the Japanese company also published 16-bit adaptations for the Super Nintendo and the Super Family Computer). Casper for the Game Boy is a mini-game compilation that only loosely follows the film, as in the beginning of the game, when Casper and Kat are seen strolling into Whipstaff Manor. They then go their separate ways, with Casper entering the first floor hallway with four doors. The first door contains a Missile Command knock-off called “Protect the Ooz,” where Casper controls a crosshair to blast his bothersome uncles before they can destroy the bottles of ooz at the bottom of the screen. No, that’s not a typo–the instant primordial soup mix is actually referred to as “ooz,” not ooze, in this game. The next door leads to “Ooz Runner,” an even more glaringly obvious clone of another classic, Lode Runner, in which Casper has to maneuver around his uncles and use ladders to pick up the misspelled stuff. Once Casper has his fill, the exit appears and he can skedaddle. The third door holds what is likely the most enjoyable and least logical mini-game of them all. Reminiscent of Fire on the Game & Watch, here Casper can transform into a trampoline to bounce the falling books to the library’s book return. Why the old mansion would have a book depository is never explained. Right before Fatso tosses a tome, a vial of ooz will appear randomly somewhere on the ground and then vanish just as fast. It’s best to position Casper by the first pillar so that he can dash forward and float to the bottle before changing form. The maximum amount of ooz that you can collect is 100. The final door finds Casper concocting a Rube Goldberg-style contraption by scrolling through and selecting assorted items to place them in the correct order. The task is to make Kat breakfast. That might sound easy enough, but Casper’s idea of cooking is to tie a rope around a live chicken and yank an egg out of the bird, which then rolls down a curved track to the bottom shelf where an egg cracker sits, sending the yolk sliding down into a frying pan. If there’s a faster and more humane way to make eggs, Casper doesn’t care to know it. After beating all four mini-games, Casper returns to the foyer and then heads up to the second floor hallway to face four more doors, where the same exact mini-games await him. The only event that changes significantly is the last one. Instead of preparing sunny side splinters, the objective is to wake Casper from his eternal slumber with another series of devices designed to knock over a bucket of water. After finishing the second set of mini-games, Casper makes his way to the third floor hallway, where he gets to play through them all over again, not unlike the ghost’s never ending purgatory. The walls in this hallway resemble Casper’s old boyhood room where the above screen-matched plaster hand casting hung as set dressing and helped him finally begin to remember who he was when he was alive. Casper places his hand inside the casting and says with astonishment, “I had five fingers. I remember!” Casper hurries Kat to the attic and finds his mother’s old dress for her to wear at the Halloween party later that night. The prop measures 8 inches across, and originally came from a back lot sale that Universal held in 1994. This time Casper has to make a bowling ball fall from the first shelf into a weight pan to cause the contents of a bucket to seep into a funnel, which then leaks the liquid into small cups on a moving platform that empty into the ooz jug on the table. He could have just poured the thing into the container himself. Thankfully, Casper has run out of hallways now, so the next mini-game is entirely new. 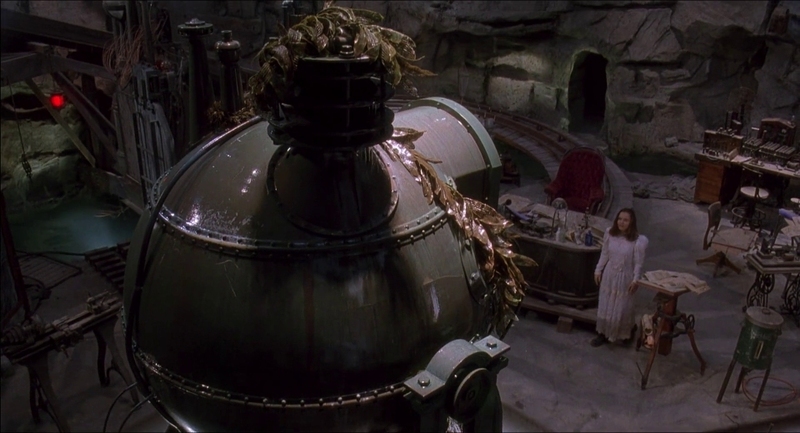 It’s the Up and At’em Machine, where Casper pushes Kat down a secret passageway towards the McFadden Laboratory. Casper’s uncles will steal ooz from Kat, while the rotating chains of shaving razors and toothbrushes will deplete his life if they touch her. 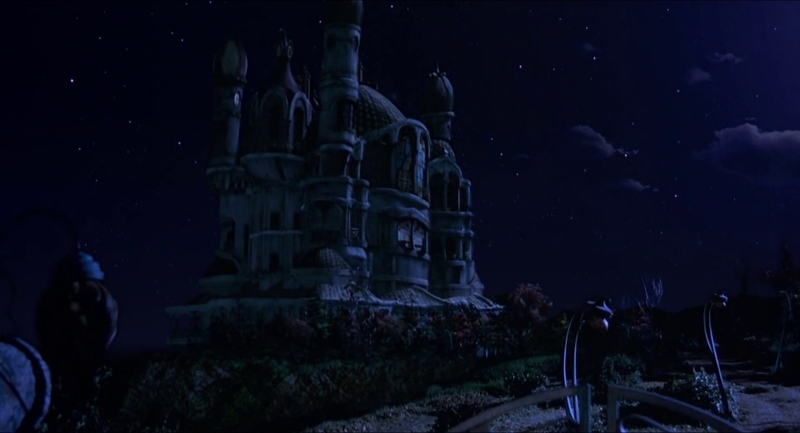 If Casper loses all of his lives or gives up enough ooz, the game will end with Stretch kicking him out of the manor to wander for all eternity, or until the player presses the Start button. To activate the Lazuras and cook some baklava for Dr. Harvey, Kat’s recently deceased father, the player will have to complete another mini-game. This time it’s a Simon memory challenge using the D-pad. If you cannot repeat the correct sequence of ghosts, another ending will play. Despite her father being forever doomed to lurk in the afterlife, the now orphaned Kat will dance with Casper in the manor’s foyer. Papa, don’t preach. If you do win, then the screen will shake, and you will be prompted to “get ooz for Casper” by going through the final Ooz Runner. Securing enough ooz will reward you with the best ending, which again has Casper and Kat dancing together, only this time with a crowd of onlookers present that look like the Doobie Brothers circa 1976. Cue the credits. This Casper pre-release sample comes from the archives of the now defunct German publisher Rushware, according to Bernd Kurtz, who used to work at THQ Entertainment GmbH as a European Localization Engineer before the company filed for Chapter 11 bankruptcy. He has been selling a great many development pieces from his former employer, which purchased Rushware in 1998 (link). Normally prototypes located in Germany would not be of much interest, since European video game releases typically came last and so in-game differences are generally rare, but Kurtz’s auctions have included several test builds and debug versions of Nintendo 64, Game Boy, Game Boy Advance, and Nintendo DS games, and even a more complete version of the unreleased Tyrannosaurus Tex, so I took a chance that the monochromatic ghost would be friendly to me. He wasn’t. 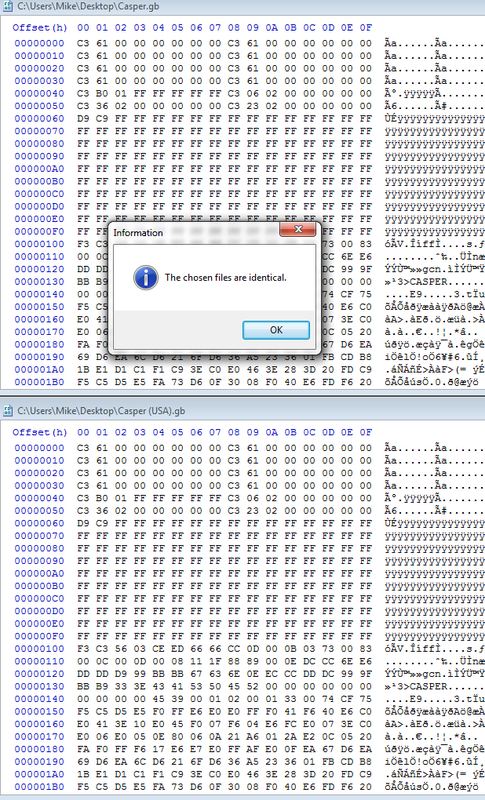 After dumping the chip, I found its data to be byte-for-byte identical to the released U.S. version. Based in Ridgewood, New Jersey and founded in 1995 by Dan Kitchen, who had previously helped get Absolute Entertainment running in 1986, Morning Star Multimedia was responsible for PC titles like Plan and Track, a Weight Watchers supplement, Casper: The Interactive Adventure, a point-and-click adventure, and Kristi Yamaguchi Fantasy Ice Skating, in which you act as the 1992 Olympic champion’s choreographer and outfit designer (link). 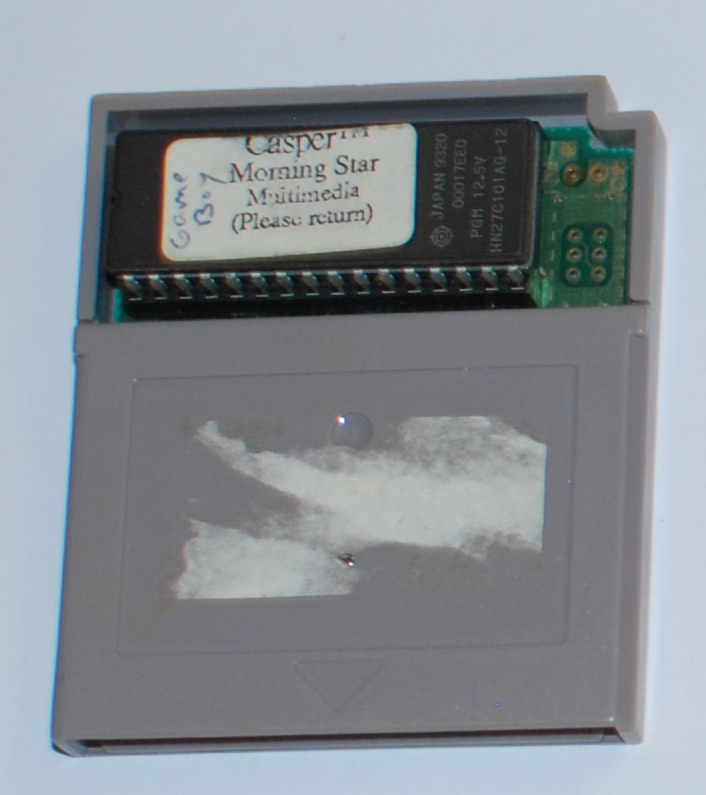 As for why a Morning Star label would be on a Game Boy prototype of Casper, a title solely developed by the New York-based Bonsai Entertainment, I reached out to someone close to the events who agreed to speak with me on the record if I did not publish their identity. “Morning Star was created by Dan Kitchen after Absolute Entertainment went bankrupt. 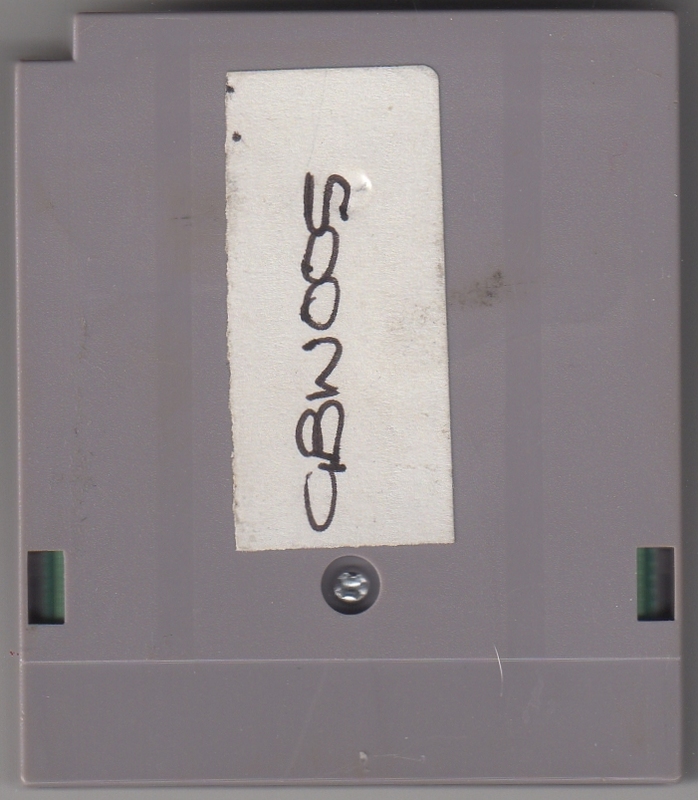 They had another Casper SKU they were working on and wanted to publish Casper on the Game Boy, which we developed for Hi Tech Expressions, which also went bankrupt. Are we seeing a pattern here?” the source said. I asked if there might be any public court filings to substantiate these claims. I reached out to Kitchen to hear his side of the story. 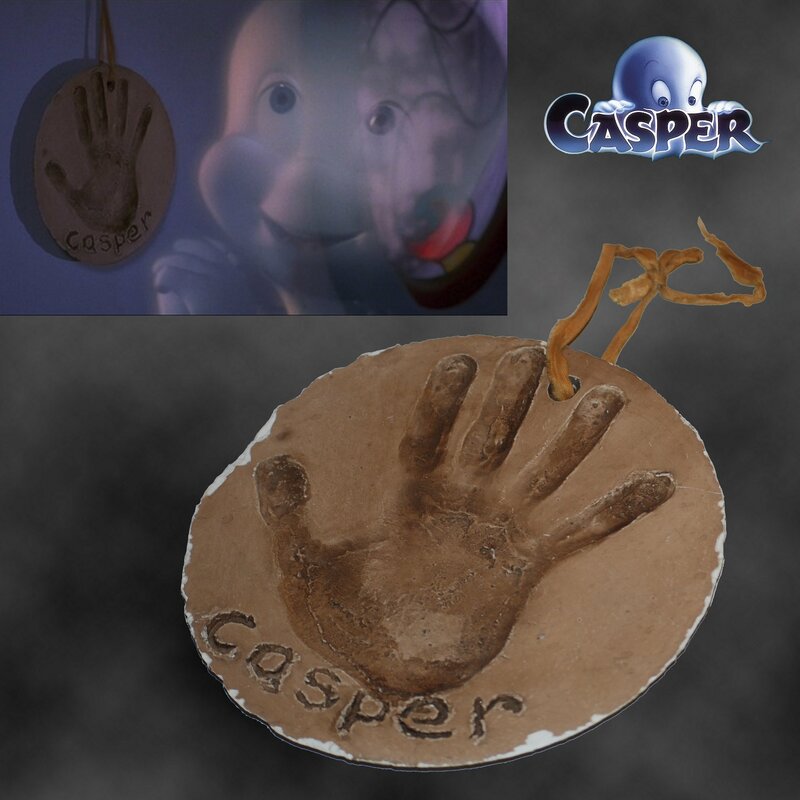 “During my discussions with the licensors, I received and reviewed the Casper ROM from Bonsai and was asked by Joe Moses to help him find a distributor for the game since I was developing a new Casper title based specifically on the motion picture,” Kitchen said. Moses is the CEO of Bonsai. According to Kitchen, he had been fired when he was employed at Absolute Entertainment for inserting an unauthorized Easter egg into an 8-bit game. “I am H. Joe Rock & Roll software engineer, game developer & noted genius,” begins the hidden message that Moses left in the code of Home Alone 2: Lost in New York for the Nintendo Entertainment System. Coincidentally, I spoke with Moses several months ago about this incident. He told me that his co-programmer on the game, Chris Will, whom he referred to as a “dickhead,” reported it to management. “However, I continued to have a professional and personal relation with Joe Moses as he and I shared common interests in music and other activities,” Kitchen added. Kitchen said that Morning Star lost money on the deal, again asserting that he was forced to pay the licensors for the Game Boy Casper, which “he did not want,” to get approval to do his CD-ROM version. Morning Star was once a subsidiary of a company called Telegen Corporation. According to an SEC filing, less than a year after acquiring Morning Star in December 1996, Telegen sold the company back to Kitchen for $200,000. The filing also revealed that Kitchen is the brother of Jessica Stevens, then a Telegen director and later its CEO (link). Jessica Stevens originally worked with Dan and Garry Kitchen at Activision as a programmer and a game designer. She would go on to be appointed to the FCC’s Technological Advisory Council in 2001 (link). Dan Kitchen claims in his curriculum vitae that Telegen originally bought Morning Star for $2.5 million (link). Morning Star continued to develop software, mostly for the Game Boy Color, up until 2000 (Frogger, Super Breakout, Tom and Jerry, Pong: The Next Level, NFL Blitz 2001). Dan Kitchen then joined Majesco Entertainment in Edison, becoming its vice president of product development and licensing until 2006 when he joined GameShastra in Princeton, which provides game outsourcing services from India (link). As of this writing, he continues to work in the industry, now as the President/CEO of Tiki Interactive LLC, which developed the iOS app Weird N.J. Hauntings (link, link). Bonsai’s March 1995 press release states that Casper was also supposedly going to appear on the Game Gear (link). A SEGA portable version ultimately never materialized, though.